Chantal’s passion is working with women suffering with addiction, and helping them find a way back to themselves. It was through her own struggle with addiction that she found Kundalini Yoga. After five years of recovery, she felt at risk of relapse but with the support of women in her life, and the discovery of Kundalini Kriyas that were used for addiction, she found the strength to push through her fear. 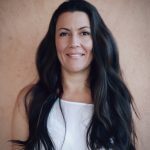 Chantal is a certified Kundalini Yoga instructor and is a candidate to receive her degree in addiction studies at Los Angeles Pierce College in December, 2017. In November 2016, Chantal became a Beyond Addiction instructor, which has allowed her to combine her studies into one practice. Chantal trained in Spain with Sat Dharam Kaur ND, founder of Beyond Addiction and she has facilitated workshops in Canada and Switzerland.